...even though it's Tuesday. I know. I know. My schedule is all outta sorts. Sorry!! I should be working on my latest story, but instead I bring you my latest choice in manga that you should be reading! Get it at Amazon.com or bookstores where you can buy Viz manga! Description: Risa Koizumi is the tallest girl in class, and the last thing she wants is the humiliation of standing next to Atsushi Otoni, the shortest guy. Fate and the whole school have other ideas, and the two find themselves cast as the unwilling stars of a bizarre romantic comedy duo. Rather than bow to the inevitable, Risa and Atsushi join forces to pursue their true objects of affection. But in the quest for love, will their budding friendship become something more complex? Why you must own this manga: Because it is the best. manga. ever. Seriously!!! 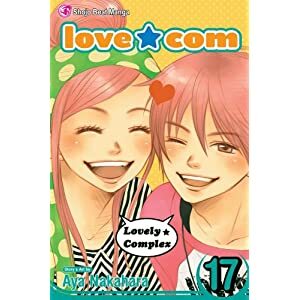 Okay, I know I say that about all the mangas I feature, but this manga will make you laugh out loud--and who laughs out loud when they're reading a book, seriously?--cry, and it will literally make your heart ache in ways you didn't even know it could. Those budding first feelings of love make you wish to be a teenager all over again despite everything you went through, just to see if you could have a romance this perfect--and this perfectly horrible. THIS IS NO TYPICAL SHOUJO MANGA HERE, GUYS! I'm not saying it's not shoujo, 'cause, it is in the biggest way possible. It's all about the relationships and romance between the characters. But these are not your typical characters. You'll find yourself desperately flipping to the next page to find out if the character pulls through in the end, because your heart just won't be able to take anymore. I can't recommend this enough. Incidentally, if you pick this up and enjoy it (and you will if you do! ), there's an anime. And it is JUST AS GOOD. But avoid the live action adaptation. It's painful.